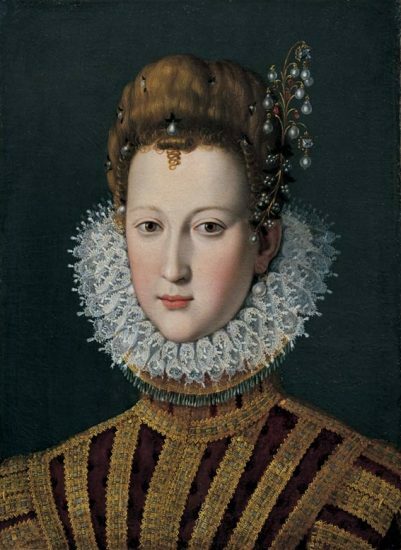 Marie was born on 26 April 1575 as the daughter of Francesco I de’ Medici, Grand Duke of Tuscany and Joanna of Austria. She married Henry IV of France in 1600 after Henry’s marriage to Margaret of Valois was annulled. His marriage to Margaret had been childless, and he was thus in desperate need of a male heir. In that regard Marie performed her duty; her first child and the future Louis XIII was born in September 1601. They would have a total of six children; only one would die in childhood. Her eldest daughter Elisabeth became Queen of Spain as the wife of Philip IV of Spain, her second daughter Christine became Duchess of Savoy as the wife of Victor Amadeus I, Duke of Savoy and her youngest daughter Henrietta Maria became Queen of England as the wife of Charles I. Her second son Nicholas Henri died in childhood, but her third son Gaston was Duke of Orléans. Despite their many children, it was not a happy marriage. Marie was not happy with Henry’s mistresses. She also showed great support for Henry’s first wife, and he finally allowed Margaret back to France. Marie’s coronation on 13 May 1610 was supposed to be a happy occasion, but Marie’s life was turned upside the very next day. On 14 May 1610, Henry was assassinated by a Catholic fanatic François Ravaillac. His son and heir was just nine years old. Upon seeing her husband’s body, Marie supposedly exclaimed, “Alas, the King is dead!” Chancellor Brûlart de Sillery responded, “Your Majesty, excuse me. Kings do not die in France.” Her son was now Louis XIII. Just two hours later Louis and his siblings were under close guard, the streets around the Louvre were being patrolled to calm the populace, and they went about securing Marie’s regency. The court went into two years of official mourning. 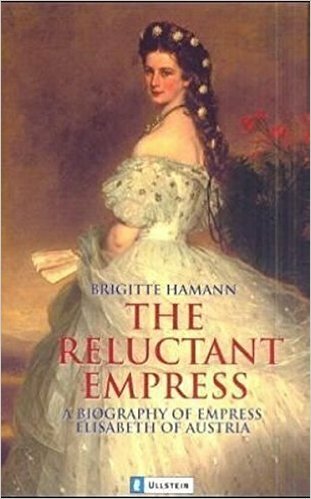 Her regency focused on avoiding internal turmoil and external danger. She had the backing of Henry IV’s ministerial team, but she was facing major problems. Religion remained a pressing issue, just as foreign relations. 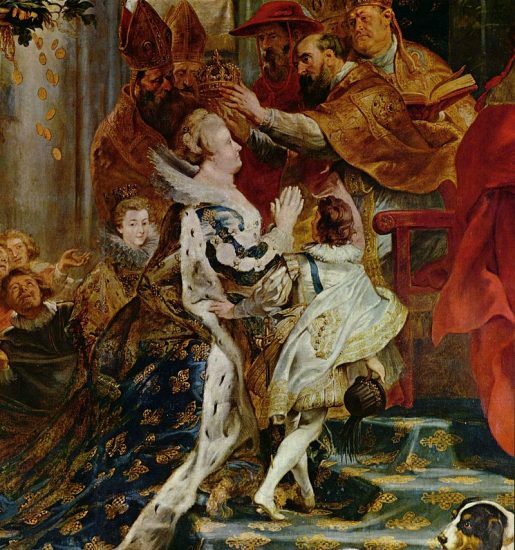 In 1612 two future Bourbon-Habsburg marriages were celebrated; Louis was to marry Anne of Austria, and her sister Elisabeth was to marry the King of Spain. This did not fix the third major problem of Marie’s regency, the noble’s unrest. Louis soon became frustrated with his lack power and Marie wished to keep him “in the habit of the greatest respect obedience toward his mother”, which is just a polite way of saying she wanted to keep him out of state affairs. On 2 October 1614 Louis went to the Parlement of Paris to formally proclaim the end of his minority, but he did tell them he wished his mother to continue as regent. He was still only 13 years old. Louis married Anne of Austria in 1615. Soon he asserted his own authority. The pro-Spanish foreign policy pursued by his mother was overturned and ordered the assassinated of one of his mother’s favourite. Marie was exiled to Château de Blois. Her fall from power was sudden. 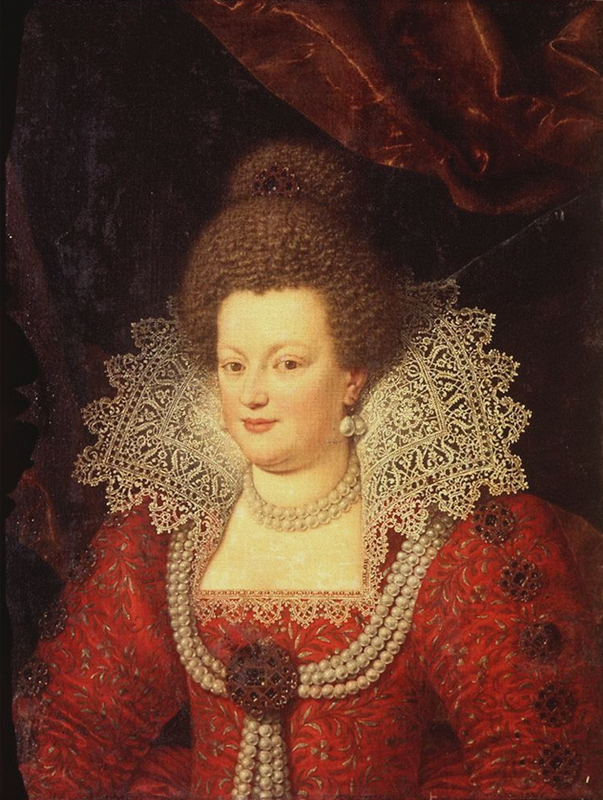 She escaped from her exile in 1619 and led a revolt by her son Gaston, which was quickly suppressed by Louis. She and Louis were eventually reconciled, and she became a part of the royal council again in 1621. She attempted to displace one of Louis’ favourites in 1630, which again led to her being exiled. 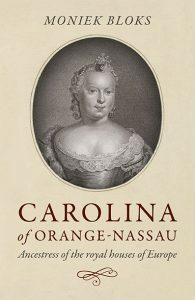 She lived in Compiègne, Brussels and Amsterdam. 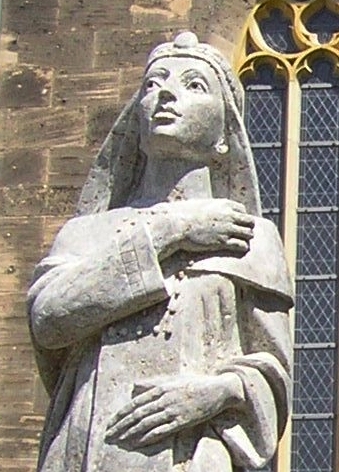 She ended up Cologne, where she died in 1642.